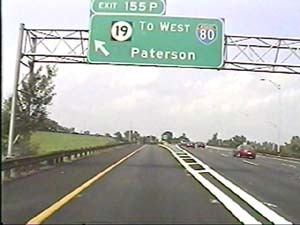 This is the beginning of the Paterson Peripheral, NJ 19 north, at the Garden State Parkway in Clifton, New Jersey. The Garden State Parkway continues north to the right. This is not the true beginning of NJ 19, which actually begins on Broad Street just south of US 46. However, the main flow of traffic follows the ramps to and from the parkway. Filmed August 24, 2000. This is the beginning of the Paterson Peripheral, NJ 19 south, at Oliver Street in Paterson, New Jersey. Originally, the Paterson Peripheral (which was once NJ 20) was proposed to continue north through downtown Paterson and meet NJ 20 near the north side of the city. However, due to opposition from the community and historical preservationists, the northern section was cancelled and this 'downtown connector' was built instead. Filmed August 24, 2000. 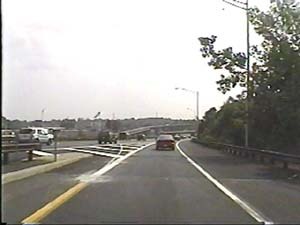 This is the Paterson Peripheral, NJ 19 north, south of exit 2(Broad Street, Clifton) in Clifton. 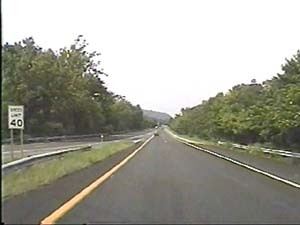 Here, the ramp from the parkway merges with the 'true' NJ 19, which joins via the ramp on the left. Garrett Mountain is visible in the distance. Filmed August 24, 2000. 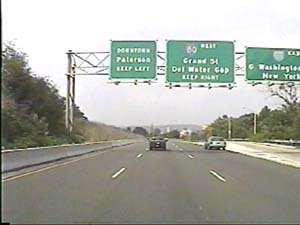 This is the Paterson Peripheral, NJ 19 south, just north of exit 3(East I-80, George Washington Bridge, New York) in Paterson. 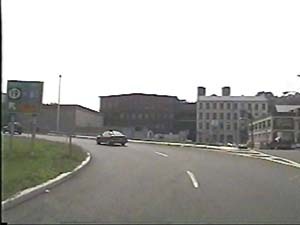 The ramps visible ahead, as well as the main roadway, wasn't constructed until the 'downtown connector' was built in the early 1990's. Also visible ahead on the right is Garrett Mountain. Filmed August 24, 2000. 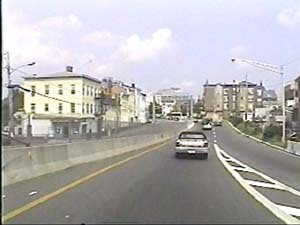 This is the Paterson Peripheral, NJ 19 north, just north of exit 2(Broad Street, Clifton) in Clifton. Garrett Mountain is visible ahead on the left. Filmed August 24, 2000. 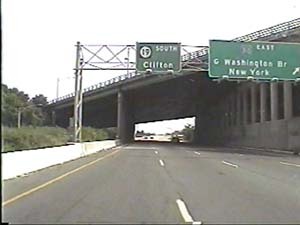 This is the Paterson Peripheral, NJ 19 south, at exit 3(East I-80, George Washington Bridge, New York) in Paterson. 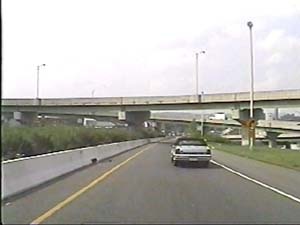 The large overpass just ahead is the Bergen-Passaic Expressway (I-80). Filmed August 24, 2000. 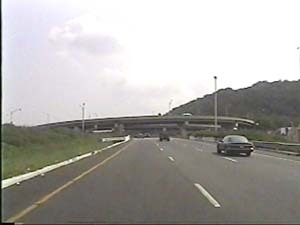 This is the Paterson Peripheral, NJ 19 north, at exit 3(I-80, Grand Street, George Washington Bridge, Delaware Water Gap, New York) in Paterson. Until the early 1990's, all traffic was directed towards I-80 east here. It wasn't until that time that the connector to downtown Paterson and I-80 west was opened. Filmed August 24, 2000. 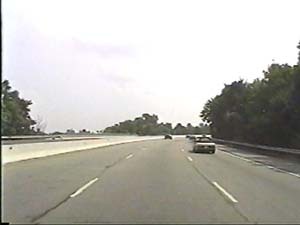 This is the Paterson Peripheral, NJ 19 south, just south of exit 2(Valley Road, Main Street, Clifton) in Clifton. Filmed August 24, 2000. 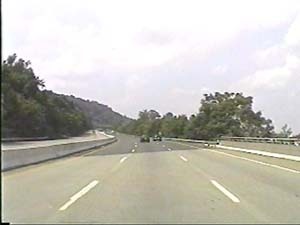 This is the Paterson Peripheral, NJ 19 north, just north of exit 3(I-80, Grand Street, George Washington Bridge, Delaware Water Gap, New York) in Paterson. The ramps ahead, as well as this section of the main roadway, wasn't constructed until the early 1990's. Filmed August 24, 2000. This is the Paterson Peripheral, NJ 19 south, at exit 1(South Garden State Parkway, No Trucks) in Clifton. NJ 19 actually follows the right ramp to Broad Street and US 46 on the right, but the main traffic flow is towards the parkway. Filmed August 24, 2000. This is the end of the Paterson Peripheral, NJ 19 north, at Oliver Street in Paterson. Originally, the Paterson Peripheral (formerly NJ 20) was proposed to continue north to meet the current end of NJ 20. However, opposition from the community and historic preservationists prevented the road from continuing north through downtown Paterson, and resulted in its now permanent end here. NJ 19 continues north as Oliver Street. Filmed August 24, 2000. 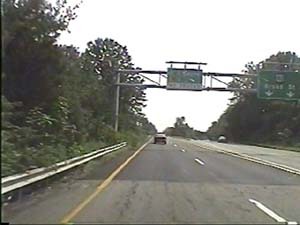 This is the end of the Paterson Peripheral, NJ 19 south, at the Garden State Parkway. NJ 19's 'real' mainline actually continues south via Broad Street to just south of US 46 before ending, but the main traffic flow joins the parkway here. Filmed August 24, 2000.